Phillip Holmstrand has put together a very interesting site that allows you batch geocode addresses in your browser. He’s using the Yahoo! 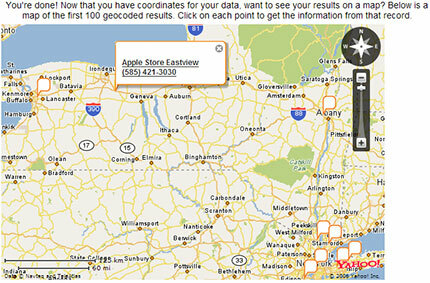 Maps API to geocode address you can pretty much just copy and paste out of any spreadsheet. I love how its so easy to use, no longer will you have to pay people money to geocode addresses as just about anyone can use it. Best of all it uses REST so there is no reloading your browser window while you perform the tasks. Its a great idea with a wonderful interface.